NCFI manufactures multiple spray foam insulation systems that are designed for a variety of commercial, residential, industrial, and institutional applications. While our InsulStar®, Sealite™, Agrithane™, and InsulBloc® spray foam insulation solutions have been formulated for specific applications, they all deliver the same level of comfort, energy efficiency, and safety that architects, builders, and specifiers like you demand for construction projects. Keep in mind our products can only be applied by contractors who have completed our GoldStar certification program. This ensures you’ll have an experienced applicator that knows our products inside and out. Spray foam insulation offers versatility for insulating your project by conforming to irregular shapes and configurations. This incredible adaptability means your designs are limited only by your imagination. All of our spray foam insulation systems are building code-compliant, too, so specifying them for your next project will make your life easier when it comes time for the building inspectors to visit your job site. A building must control three elements: moisture, temperature, and air-flow. 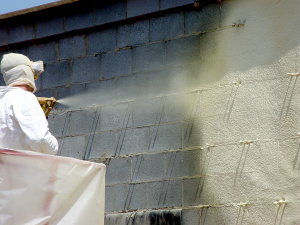 Spray foam insulation can improve these aspects of a building dramatically. Since our solutions surpass industry standards, providing the most rigid envelope systems, a building’s durability and sustainability can be improved.